Wonderboy clone, and it's a pretty good one at that. gallery is that the color palette is too dark. Right, Right, Left, Left, Right, Left. A cheat option should appear if it is entered correctly which will give you lots of goodies. a great game. the sprites are truly amazing! if you like mario you'd probably like this one too! This game rocks! GO SCOTLAND!!! An excellent game. 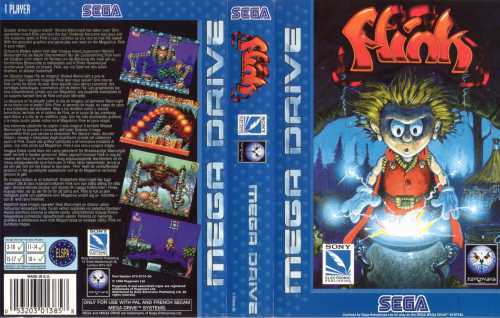 One of the megadrive games I'd like to own even now, on a par with the likes of Shining Force 2 for quality. 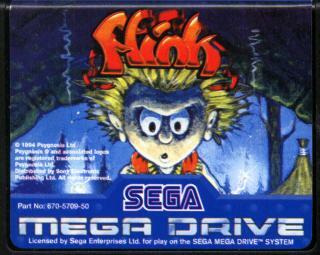 I remeber flink being a great game on the CD32 with CD audio, if you want to see the previous authors work check out the Thalion Webshrine. 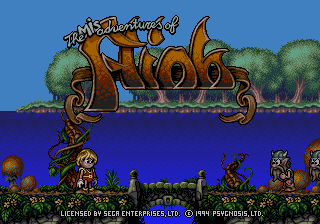 The artists and one of the musicians worked on games such as "Enchanted Lands", "7 Gates of Jambala" and "Lionheart"
I've seen many games for SEGA MD, but this one is graphically the best of them. A truly amazing work of artists. 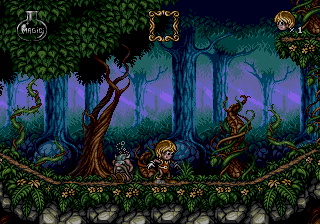 I don't know how they managed to do such an eye-candy artwork in 64-colours palette. Animation is perfect! The characters and bosses are almost alive and breathing. Music is also excellent. I didn't like the gameplay, though. It is too slow for my taste. But, still, I just had to complete this game only because of the graphics and music.